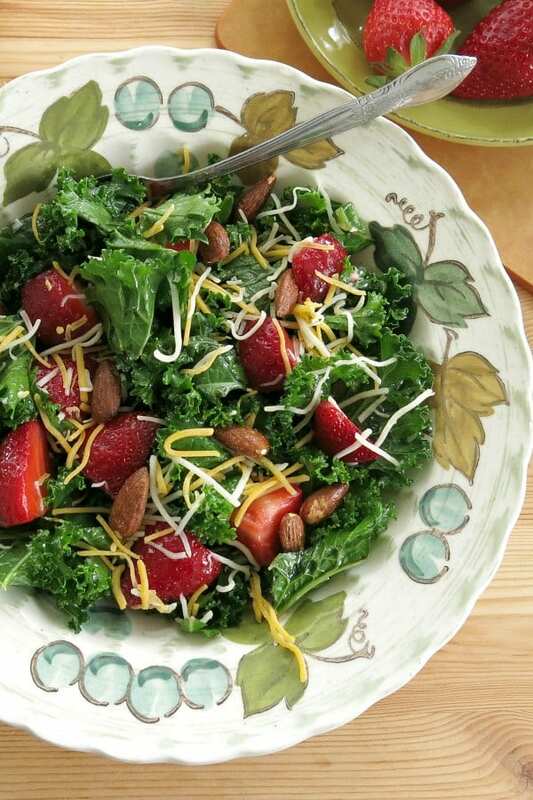 Massaged Kale Salad with strawberries, almonds, and cheese is so delicious you’ll forget that it’s good for you. Discover the secret for preparing kale leaves that are soft and tender. Do you have a strong opinion about kale? If you’re in the never again camp, then you may have had a dish that just wasn’t prepared properly. Or, perhaps it wasn’t the best type of kale to use in a salad. This used to be a problem at our house until we discovered we’d been doing it all round! Now we enjoy Kale Apple Slaw, Kale Quinoa Salad, Crispy Kale Chips and even smoothies with kale on a regular basis. Don’t let a bad kale experience deter you from enjoying this healthy green and reaping the health benefits! We’ll show you how to make a simple kale salad with a honey dressing that can be customized with your favorite mix-ins. It’s easy! All you need to do is select the best type of kale, give it a massage and add then toss it ingredients with a variety of textures. Any type of baby kale! This type really doesn’t even need a massage. Curly kale, which is commonly found in the grocery store. Remove the woody stems from this variety. Tear the kale leaves into bite-sized pieces, discarding the stem if it is too tough. To begin the process, squeeze the juice of a lemon over the torn leaves and then drizzle them with olive oil. Sprinkle a little salt over the leaves too. I use a minimal amount of salt and sometimes I skip this step altogether to avoid extra salt. Gently massage each leaf until they are well coated and begin to soften. It takes about 3 minutes. After the leaves have marinated, toss in your favorite goodies. Imagine the possibilities! Blackberries, blueberries, sunflower seeds, various cheeses…it’s mind-boggling. A combination of textures keeps the salad interesting. Unlike regular salad greens, kale leaves stay hearty enough to eat the next day! 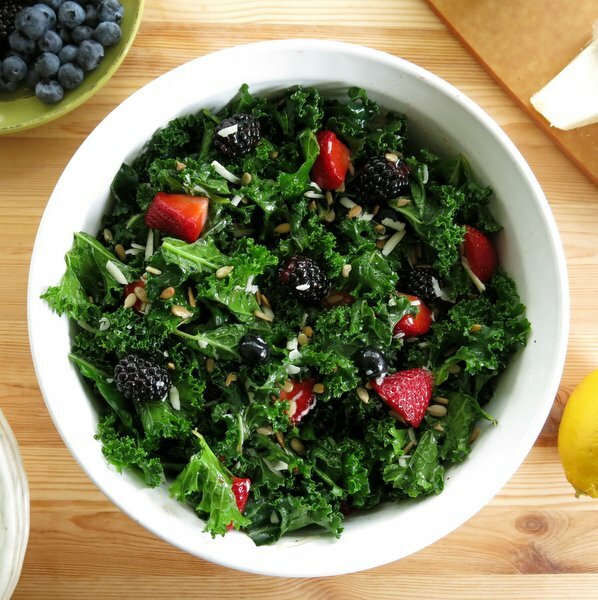 So go ahead and make a big bowl Massaged Kale Salad so you’ll have plenty to enjoy the next day. After a bit of experimentation, the combination of toppings we used in this Massaged Kale Salad is strawberries, almonds, and shredded Monterey Jack cheese. Marinate kale leaves in lemon and olive oil for soft tender greens. Top it off with strawberries, almonds and cheese and drizzle of lemon honey dressing. Wash kale and tear into bite-sized pieces, discarding woody stems. Drizzle 1 Tablespoon olive oil and salt over the leaves. Massage leaves with fingers until they are coated and softened, about 3 minutes. To prepare the dressing, combine 1/4 cup of olive oil, juice from the remaining lemon and honey in a small bowl. Drizzle dressing over kale greens and toss to coat. Add strawberries, almonds and cheese, toss and serve! Great looking salad, and you’re right. Once you get the hang of massaging the kale, you can let your imagination soar with tweaking the ingredients! We’re going to share on our Facebook page and link here so people can see your pretty salad and how to make it. Keep on keepin’ it green! Thanks so much! 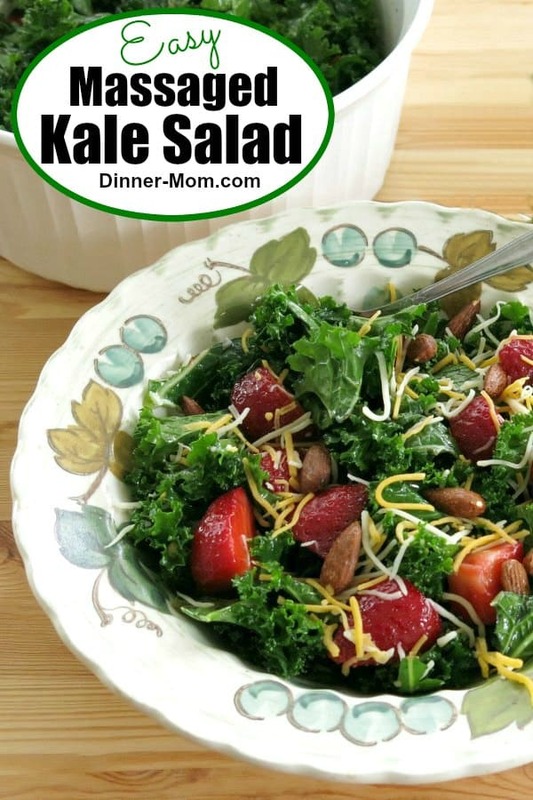 We’ve been enjoying variations of kale salad quite a bit lately! Hoping to share some more soon. 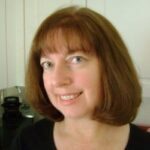 Heading over to enjoy your FB page! 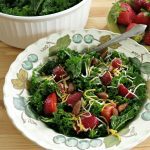 I love a massaged kale salad, but your add ins make this one super tasty!! Can’t wait to make it again! That for your comment Liz! And now I know the secret to making kale more palatable. I must admit, I haven’t had any for years – time to change things up. Time to give it another try!